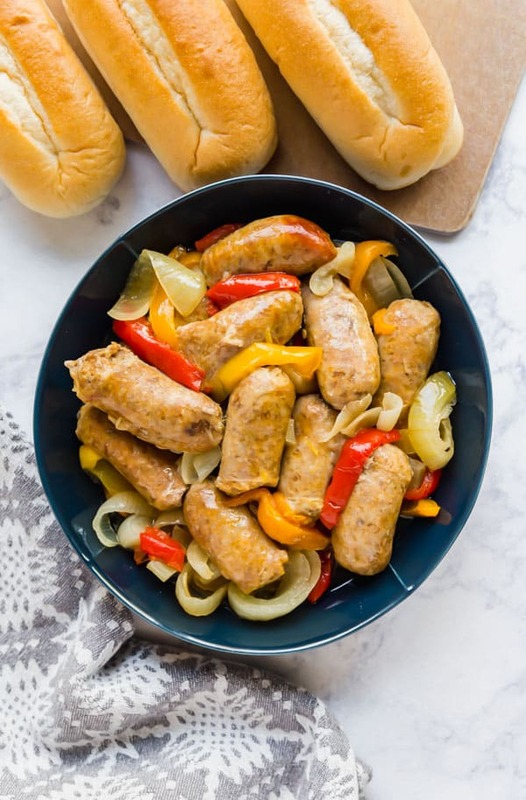 Slow Cooker Sausage and Peppers is a delicious and easy way to make some fantastic sausage sandwiches. Just dump the ingredients into your crockpot (or instant pot) and let it do the rest of the work! It never occurred to me to make a sausage and peppers recipe for the crockpot until my sister told me about it. She said it was crazy easy and so good, so naturally I had to try it. And when I saw how easy it was how how minimal the work was, I knew this would be perfect for my dump recipe series! This is the epitome of a dump recipes. 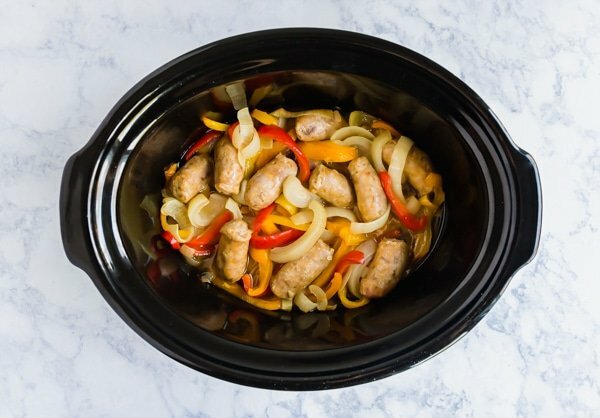 You basically just slice some onions and peppers, halve the Italian sausage links and a splash of white wine if you want and throw it all into the slow cooker, instant pot or zipper bag. It’s really that easy! And totally delicious as well! I try to slice the peppers and onions on the thicker side so that they don’t cook down to nothing. I like to cut my sausage links in half to make them a more manageable size but if you prefer to keep them whole, that’s fine too. Be sure you’re cooking these on low. I tested them on high, but they just didn’t turn out right texturally. How do you serve sausage and peppers? 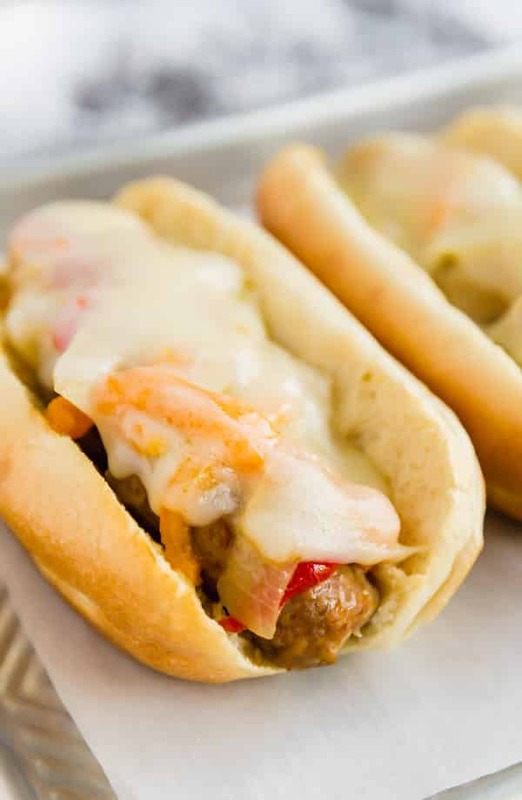 I like to serve them on a bun with provolone or mozzarella cheese, but you can also eat when with a fork and knife and the sides of your choice? 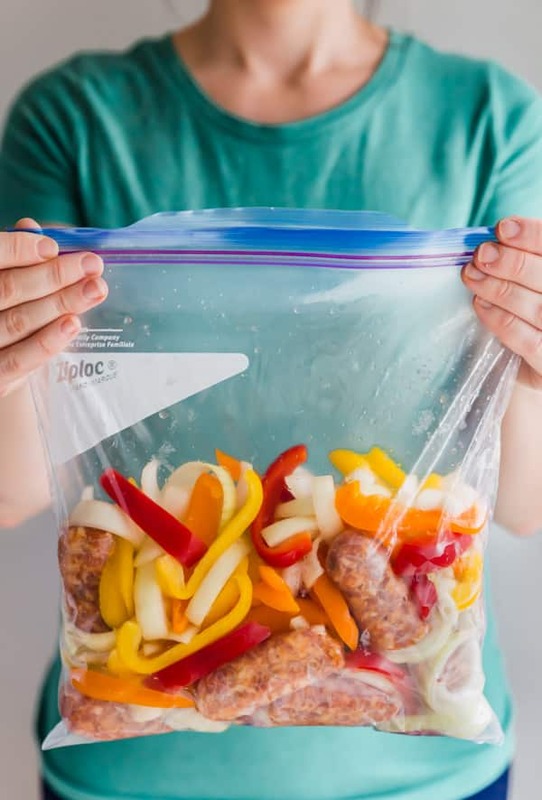 Can you freeze sausage and peppers? Yes, but do it prior to cooking. How long do sausage and peppers last? These last 3-4 days covered in the refrigerator. Sear the sausage prior to placing in the slow cooker. 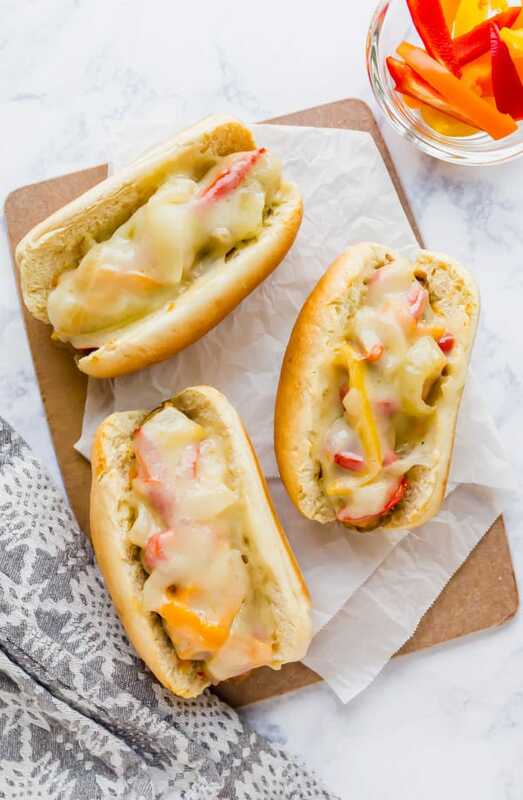 If using buns, place them into a 350 degree oven for 5 minutes to toast them a bit, top with the cooked sausage, peppers and onions, and then with slices of provolone or mozzarella cheese and return to the oven for another 5-10 minutes to melt the cheese. Throw a bag of frozen french fries or tater tots onto a pan and bake to serve with this. 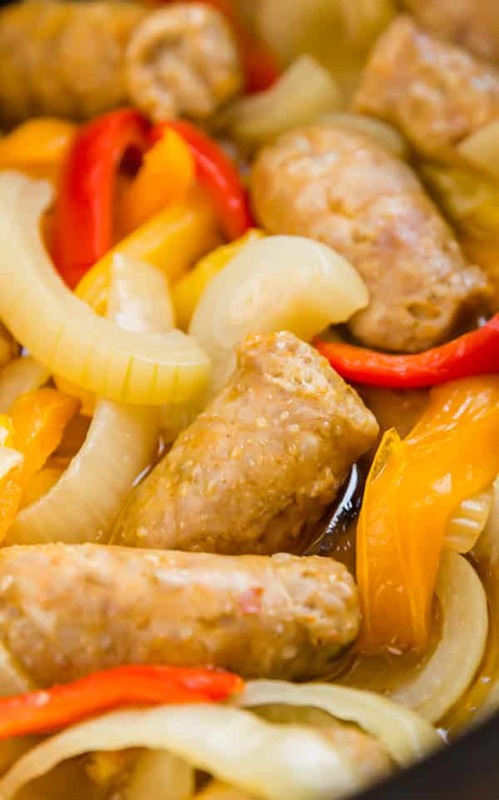 Place sausage, peppers and onion into the slow cooker and top with a splash of wine (or place the ingredients into a zipper bag and freeze- thaw before cooking). Cover the slow cooker and cook for 4 hours on low heat. Serve immediately. 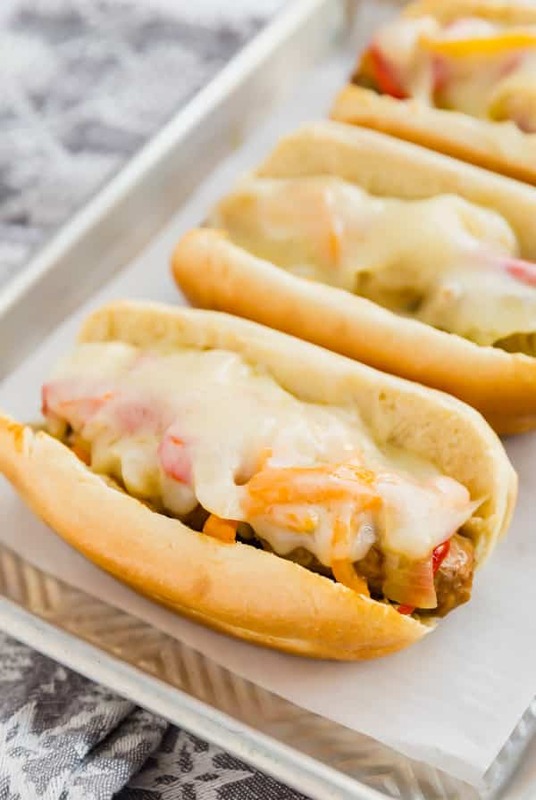 (Optional- you can toast cut hero rolls for 5 minutes at 350 degrees, top with cooked sausage, peppers, onions and slices of cheese. Return to the oven nd bake 5-10 minutes until the cheese is melted). Now that you know how to make Slow Cooker Sausage and Peppers be sure to share them and tag @thelifejolie on Instagram and Facebook. And be sure to pin it to save for later or bookmark it!